University of Chicago Press, 9780226573151, 224pp. How do poems and novels create a sense of mind? What does literary criticism say in conversation with other disciplines that addresses problems of consciousness? 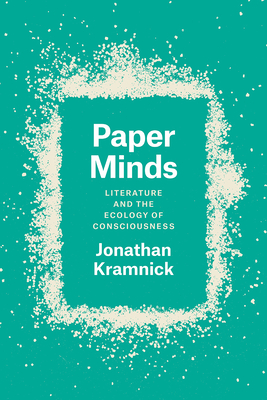 In Paper Minds, Jonathan Kramnick takes up these vital questions, exploring the relations between mind and environment, the literary forms that uncover such associations, and the various fields of study that work to illuminate them. Opening with a discussion of how literary scholarship’s particular methods can both complement and remain in tension with corresponding methods particular to the sciences, Paper Minds then turns to a series of sharply defined case studies. Ranging from eighteenth-century poetry and haptic theories of vision, to fiction and contemporary problems of consciousness, to landscapes in which all matter is sentient, to cognitive science and the rise of the novel, Kramnick’s essays are united by a central thematic authority. This unified approach of these essays shows us what distinctive knowledge that literary texts and literary criticism can contribute to discussions of perceptual consciousness, created and natural environments, and skilled engagements with the world. Jonathan Kramnick is Maynard Mack Professor of English and director of the Lewis Walpole Library at Yale University. He is the author of Making the English Canon and Actions and Objects from Hobbes to Richardson. "In Kramnick's terms, literature is good at representing character’s mental enmeshment in earth and material and flesh precisely because these practices are like those that critics use--and teach students to use--as they write professionally about the world. Literary criticism becomes in this account a practical kind of handicraft at the level of the sentence. . . . [A] beautifully made and well-timed point about the value of literary-critical thinking in its specificity. . . . [A] careful plea . . . for literary representation as a site of action in the world." "In this series of elegantly connected essays, Jonathan Kramnick excavates a kinetic, haptic, and immersive alternative to contemplative aesthetics in the eighteenth century and follows its ramifications into contemporary debates about theory of mind. How does free indirect discourse offer its own way of working through the 'hard problem' of consciousness? What can apostrophe teach us about the supposed divide between perceiving the world and acting in it? Moving deftly from locodescriptive poetry and common sense philosophy to novels about cognitive science, these astute and sometimes polemical writings broaden our understanding of what an aesthetics and ethics of everyday dwelling might be and of how literary forms provide unique insight on theories of perception." "Paper Minds places literary study proudly in the company of other university disciplines, both in theory and in practice. Kramnick's philosophic concerns and his precision about cognition drive brilliant readings that range from all but forgotten landscape poems, to old novels as obscure as The Blazing World or as familiar as Robinson Crusoe, to prize-winning novelists of the present century. He probes the mystery of conscious experience with revelatory lucidity. His aesthetics of craft and the everyday--if perhaps tinged with urban nostalgia--precisely carve out an alternative to the classic aesthetics of distance." “The essays assembled here are distinguished by a supple, eloquent prose and by their humane tone. They offer an eye-opening picture of how, from the eighteenth century onward, a particular set of literary forms has made it possible to set down ‘perceptual or emotional or cognitive experience on the page.’ Paper Minds is a landmark book both for scholars of eighteenth-century literary studies and for scholars from other periods working at the intersection between literary analysis and cognitive science." "Paper Minds is beautifully written in elegant, witty prose with maximum clarity. It makes original contributions to at least three fields: cognitive literary criticism, eighteenth-century British studies, and the study of contemporary literature. This is a book to read and re-read carefully, and to feature prominently in any discussion concerning the contributions and merits of a cognitive approach to literature."